St Edmund's Church in Emneth houses an altar tomb of Sir Thomas Hewar by Nichlas Stone (1631). 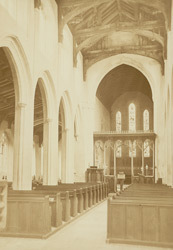 "On a careful examination of this Church, it is evident that the original structure was commenced towards the latter part of the 12th century...The general effect of the interior of this church, on entering by the great western doors, is grand and striking - suggesting the idea of a miniature cathedral - and delighting the eye by the symmetry of its lofty proportions. It must be admitted that the exterior view does not prepare the visitor for the stateliness and dignity of the interior." Text by Vicar of Emneth J W Berryman from the book 'The Fen and Marshland Churches'.